Traditional Building is the only magazine that focuses on traditional design in public and residential architecture. Traditional Building highlights historic preservation, adaptive re-use, and new traditional design for commercial, institutional, and government buildings — as well as civic spaces and landscapes. ​Hidden away in a Minneapolis residential neighborhood, Christ Church Lutheran is one of the nation’s first modernist churches and an extraordinary example of twentieth-century ecclesiastical architecture. Designed by Eliel Saarinen, the chapel is adjacent to a later addition designed by his son, Eero Saarinen. Period Homes speaks to the traditional design trade exclusively working on authentic well-designed houses on a national scale. The go-to resource for information on traditional materials, design practices, regional projects, and company profiles, Period Homes highlights new traditional design, landscapes, restoration, renovation, adaptive re-use, and sympathetic designs for traditional residential architecture. Dotted along the coast of New England are the grand summer cottages of wealthy 19th-century industrialists, lawyers, and businessmen. Clad in plain, unpainted shingles, these homes are simple and graceful and in stark contrast to the ornate busyness of Queen Anne architecture, the prevailing style of the time. WaterColor, Florida, is a planned resort and residential community. Located on the Gulf of Mexico, its traditional beach cottage homes feature wide porches and an inviting style. Architectural guidelines help preserve the character of the community but are flexible enough to allow residents to create a home that reflects their personal tastes and styles. USGBC+ is a publication primarily for members of the U.S. Green Building Council. The magazine supports the USGBC's mission by profiling individuals, organizations, communities and projects that showcase sustainability, innovation, and social responsibility initiatives designed to improve our quality of life. theMART is interwoven into the fabric of Chicago as an innovator in culture, art, business, fashion, media, and more. It is the largest privately held commercial building in the United States. This year, theMART used the ARC platform to pursue LEED certification and track sustainability data going forward. For actor and environmentalist Ed Begley Jr., sustainable living is second nature. As a child, his father taught him to save string and tin foil, turn out the lights, conserve water, and throw out as little as possible. Having lived through the Great Depression, Ed Begley Sr. abhorred waste. He died in April 1970, just a few days after the first Earth Day. 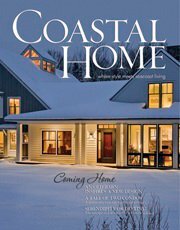 Coastal Home is a home, garden and lifestyle publication centered on the beauty of northern New England coastal living. Featuring a blend of cosmopolitan trends and relaxed style, Coastal Home is passionate about discovering extraordinary homes, from luxurious seaside retreats to lovely coastal cottages. We also invite readers into the distinctive gardens of the area, offering useful information to novice and expert gardeners while presenting the most current trends in garden and landscape design. Cape Ann is little more than a rocky outcrop on the coast of Massachusetts, just north of Boston. At the tip of the cape is the town of Rockport, which is known for artists, fishermen, and granite. With its picturesque, rocky coastline and thriving artist community, it is the ideal place for Rocky and Jane Forsyth to enjoy their retirement. And in 2004, they found the perfect home. Well, almost perfect. ​Kittery Point is a bohemian community on the coast of Southern Maine. Far from the hustle and bustle of the outlet malls, it lies in a quiet world of harbors, saltwater creeks, and small islands. With its proximity to Boston and Portsmouth, it is surprising that this charming little community has managed to remain affordable. It has often been said that the story of baseball is the story of America. If that is true, Luis Tiant may be in the best position to tell both stories. The charismatic pitcher’s career in the Major Leagues spanned 19 years, starting in 1961, when the Cleveland Indians purchased his contract from the Mexico City Tigers. After spending three years in the minors, he debuted with the Indians in 1964, pitching a shutout victory against the New York Yankees. He went on to pitch for the Minnesota Twins, Boston Red Sox, New York Yankees, Pittsburgh Pirates, and California Angels. And though he played for other teams, to Red Sox Nation, Luis Tiant is a legend. ​Andrew Carnegie, Jay Gould, Andrew W. Mellon, J.P. Morgan, John D. Rockefeller, Charles M. Schwab, and Cornelius Vanderbilt were among the great industrialists and financiers of the late nineteenth century. It was a time of rapid economic growth and ostentatious displays of wealth. On Boston’s North Shore, grand summer cottages were built along the rocky coastline and a vibrant summer community grew up alongside historic fishing villages. Walking through Portsmouth’s South End, it is hard to imagine this New Hampshire area was once declared a slum and that many of the antique homes were to be demolished. In the 1950s, the South End was a rough-and-tumble neighborhood with dilapidated tenement houses, prostitution, and violent crime. But when the city seized 10 acres by eminent domain to embark on a federally funded slum clearance program, the community was galvanized to preserve the city’s historic architecture. ​The Arts and Crafts movement began as a response to the Industrial Revolution. It espouses the values of natural materials, skilled craftsmanship, economy of form, and honest expression. At its core, it celebrates the relationship of artisans to their crafts. The bungalow is perhaps the most well-known of architectural styles to come out of the Arts and Crafts movement. But this grand, 1910 Craftsman on the Massachusetts North Shore also has its philosophical foundation in the Arts and Crafts movement. The first floor features spacious rooms with beautiful, natural woodwork and an abundance of windows that allow sunlight to stream into the house and highlight the beauty of the outdoors. It is typical of the large, rambling homes built in New England around the turn of the last century. ​Driving through Kennebunkport, it is easy to get distracted by the spectacular ocean views along the rocky shoreline. Historically, Kennebunkport was a shipbuilding and fishing village. Today, mansions built by sea captains in the early 1800s serve as restaurants, Inns and private homes. Lobstermen fish the waters along the coast and sell their catch at the wharf. When Darcie Bundy decided to build a summer home for her family, she wanted something outside the hustle and bustle of the village. She found the perfect piece of land overlooking the lobster shacks on Turbats Creek. Plaice Cove is one of many small, sheltered bays along the seacoast in New Hampshire. With a secluded beach surrounded by a rocky shoreline, it is the perfect place to spend the summer or to just get away from the daily grind. For Lou and Colleen Fantozzi, who discovered the area almost by accident, Plaice Cove provides the perfect refuge. ​Corporate interior design is not often thought of as vibrant, bold and energetic. For many of us, the term evokes images of beige walls, neutral carpet and unremarkable artwork designed to ensure that no one client, visitor or employee finds his surroundings distasteful. But then, few of us have ever seen a corporate interior designed by Renee Carman of Mandeville Canyon Designs and Stephanie Morrison of Morr Interiors. In New England vernacular architecture, the connected farmstead is characterized by the linking of house to barn. It is unique, not only because of the physical relationship, but because the architectural style of the house extends to the barn. ​The next time you want to start a spirited discussion, bring up the subject of man caves. Women’s reactions to these male-dominated spaces are varied. But for men, a man cave is the holy grail of home improvement projects. So, what is a man cave? And why is the status of those who have such a place instantly elevated in the eyes of his peers? When Tim and Anne Halvorsen retired, they knew they wanted to live in a vibrant community away from Boston traffic. They wanted to see the water from their home and have access to a deep water dock and the ocean. After searching for a year, they found what they were looking for on the banks of the Cocheco River in Dover, New Hampshire. ​Chris Tierney loves to cook. So when she had the opportunity to renovate her 1960s summer home, she knew exactly what she wanted. No longer would the kitchen be a small room relegated to the back of the house. The kitchen — and the cook — would take center stage. Fiber Art Now is a quarterly print magazine, created to inspire and connect the contemporary fiber arts and textiles community. Each issue of Fiber Art Now includes feature articles and editorial content that seeks to inspire, connect, and inform fiber artists, enthusiasts, educators, learners, arts professionals, and collectors. ​Camille Myers Breeze spends her days conserving textiles and building a knowledge base to help others do the same. As the Director and head conservator of Museum Textile Services in Andover, Massachusetts, Camille has seen it all. Imagine priceless 300 year-old wall hangings that originated in Tibet and depict Buddhist images framed by ornately woven silk. Now imagine those revered religious icons 300 years and 17,000 miles later. ​Since 1970 the Textile Arts Alliance of the Cleveland Museum of Art has organized Fiber: Focus, a triennial, juried exhibition of fiber arts. The current exhibit, on display at the Canton Museum of Art through March 4, 2012, is both beautiful and thought-provoking. It raises questions about the nature of contemporary fiber art, how boundaries between different artistic media can be stretched and the motivations for artists to use specific techniques. Footnotes is the newsletter of the Friends of the Newburyport Public Library. Through a variety of volunteer activities, the Friends promote awareness of the Library, encourage public support for the Library and raise funds to support and enrich many library services and programs. Friends are library users, library lovers, and library supporters. ​In 2010, Joel Brown released Mirror Ball Man, the first in a series of self-published Libertyport mysteries. A journalist since the early 1980s, Joel’s assignments have ranged from political scandals, murders and the behind-the-scenes scoop about local news anchors to rock concerts and Hollywood films. In more recent years, he has commented on Greater Boston’s arts and culture scene for the Boston Globe and through his blog at HubArts. Last month, Erica Holthausen sat down with the author to talk about how these experiences, and life in Newburyport, influenced the writing of both Mirror Ball Man and the recently released Mermaid Blues.